Overview - One of Hollywood's greatest directors teams with a cast of incredible screen legends for this bold, sweeping tale of a ship's captain who ventures west to find a hotbed of jealousy, hatred and dangerous rivalries. As the reluctant hero is thrust into the maelstrom, he must summon all of his resolve to save not only his own life, but also the life of the woman he loves. Four-time Academy Award(R) winner William Wyler directs this action-packed adventure that triumphs as "a work of art" (Motion Picture Herald). Starring Gregory Peck, Charlton Heston, Jean Simmons, Chuck Connors and Burl Ives (in an Oscar(R)-winning performance), this magnificently entertaining epic will take your breath away with unbridled suspense, exhilarating excitement and explosive drama on a grand scale. The world can be a difficult place to navigate at times, and it's often easy to lose one's way out there in all the confusion. Right and wrong get mixed up in a guessing game of dueling ambitions and hidden agendas, and a clear path toward an amicable solution gets tossed away in favor of bloody vengeance. With a vast expanse of violence, trickery and greed laid out before us, our only tool to get back on the right track becomes an innate sense of direction led by a strong moral compass. Sadly, for some that just isn't enough, but for others, like James McKay, the noble protagonist of 'The Big Country,' it's more than sufficient. A western epic about feuding families and opposing ideologies, the film is an intelligent and sweeping exercise in classic Hollywood spectacle, one that is elevated to powerful art by acclaimed director William Wyler. James McKay (Gregory Peck), a New England sailor, journeys to the Old West to meet up with his fiance, Patricia Terrill (Carroll Baker). A kind, easy going man with a gentle demeanor, McKay instantly clashes with the locals, specifically the Hannassey brothers, who are prone to a more hotheaded temperament. As a bitter decades-spanning feud over land between the Terrill family and the Hannasseys heats up, McKay unwittingly gets caught in the middle. With both groups thirsty for blood, James attempts to find a peaceful solution. Unfortunately, it seems like a nonviolent outcome may simply be impossible in the harsh terrain of the Old West, spelling possible doom for the noble sailor and his loved ones. Throughout the film McKay is a literal fish out of water, a sea captain who finds himself thrust into a completely foreign land. It isn't just the dry terrain or rugged clothing that's alien to the character, it's the actual behavior of the angry, childish people around him. Peck plays the sailor with a level of moral fortitude and internal strength that only he could exude. As sides are taken and strategies are discussed, through Peck's kind and rational demeanor alone, it's clear that whatever position McKay takes is likely the right one. There is an effortless heroic air to the character and Peck manages to be both modest and ultimately intimidating in the role. This is a man who goes out of his way to avoid a fight, that doesn't need to prove anything to anyone but himself. This reluctance to conflict makes his eventual call to arms all the more powerful, as it's clear that he's truly found a cause worth fighting for. The character's peaceful intentions become the thematic core of the film and the manner in which his efforts are constantly dashed by violent methods creates much of the narrative's drama. 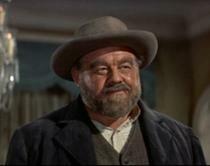 The rest of the cast is made up of an exceptional ensemble that includes Jean Simmons, Burl Ives, Charles Bickford and Charlton Heston who all do a great job of giving form to the story's discordant philosophies. Director William Wyler employs a visual style that stays faithful to Golden Age Hollywood bravado while still carving a strong artistic identity of its own. Many striking shots of vast Old West landscapes create a sense of limitless scope. The director often chooses to film his scenes in wide masters, maintaining an epic, classical, painterly air throughout. Many action sequences feature tried-and-true western sensibilities, including an opening setpiece that involves some over-the-top trick horse riding. With that said, Wyler does break away from tradition in some rather powerful ways. A moonlit brawl between Peck and Heston's characters becomes a moody and atypically awkward fight scene. While the film features a fittingly rousing score, most of this sequence is actually silent, save for the thump of angry fists smacking against flesh and bone. As the sailor and cowboy battle, Wyler cuts to many wide shots, emphasizing how small and insignificant their squabble really is. 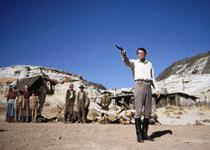 Similarly, the movie's climax features a famous, brilliantly staged duel that actually plays against genre conventions. A wonderful sense of humor is also present throughout the proceedings, with Peck employing some surprisingly amusing physical comedy. In addition, there's a slightly self referential running gag that involves characters constantly mentioning what a "big country" they live in. Though its epic running time might prove a bit much for some viewers, the slow build is effective and Wyler manages to maintain a steady pace with no unnecessary padding. As childish bickering between families takes a deadly turn and greed and hypocrisy lead to bloodshed, it becomes clear that some people simply don't have the tools to successfully navigate the twists and turns of this "big country" that we live in. Through James McKay, Gregory Peck crafts a memorable and inspirational onscreen hero that somehow ends up both clashing against and embodying everything a mythic cowboy is supposed to be. At one point during the film, everyone assumes that McKay has become lost out in the wilderness, that a man of his temperament and bearing could not possibly know where he's going during the dead of night in the Old West. Even when he rejoins the naysayers, they refuse to believe that he actually knew where he was going and chalk up their reunion to luck. Of course, the reason he was able to find his way could not be any simpler. He just made a map, took a compass and followed it... something every man could stand to do. 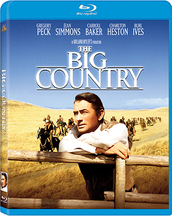 MGM brings 'The Big Country' to Blu-ray on a single region A BD-50 disc in a standard keepcase. The movie automatically plays upon startup, forgoing an initial menu screen. The film is presented in a 1080p/AVC MPEG-4 transfer in the 2.35:1 aspect ratio. While much of the video presentation is actually rather stunning, a few persistent technical anomalies do hamper the overall score. Outside of a fairly dirty and damaged main titles sequence, the source is mostly pristine with just a few very minor specks here and there. A light to moderate layer of fine grain is present throughout, adding a pleasing level of texture to the image. Clarity can be exceptional, showing off the breathtaking Technirama cinematography well. The tanned, sweat glistening faces of the characters come through sharply, revealing tiny, intricate details. Period piece clothing and set design show off a wonderful mixture of down-and-dirty cowboy exteriors and more opulent and extravagantly decorated interiors. The real draw here are the many sweeping, epic outdoor sequences and numerous wide shots of striking vistas, narrow canyons and limitless fields that fill the frame with gorgeous images seeped in a vivid palette of yellows and browns. A great sense of dimension is created in these shots giving the picture some impressive depth. While the earthy color scheme and flesh tones don't exactly look natural, the rich, rustic hues pop right off the screen and help to give the film an effective Old West feel. Contrast is well balanced with bright whites that don't overpower the image. Unfortunately, despite the many strengths mentioned above, there is one major caveat that does end up detracting from an otherwise strong viewing experience. Slight color pulsing is visible from time to time but even more troublesome is some pretty frequent flickering in the image. While not constant, the picture does often flutter in appearance. Nighttime scenes are the most bothersome, as black levels sometimes fluctuate rapidly in intensity within the same shot, gaining a slight blue tinge. At its worst, the flickering in brightness can reveal some unsightly horizontal banding lines during dark scenes. Some instances are less distracting than others, but depending on how sensitive one is to the effect, it can get pretty annoying. Still, this anomaly really is the only drawback to an otherwise fantastic image. In fact, if it wasn't for the flickering and floating blacks this would have easily been a 4.5 and possibly even a 5 star transfer. With breathtaking Technirama cinematography that shows off the film's beautiful shooting locations and set designs well, 'The Big Country' impresses quite a lot in this Blu-ray presentation. Unfortunately, despite admirable restoration efforts, frequent visual anomalies involving flickering, pulsing and black level fluctuations do hurt the transfer to a noticeable but thankfully no where near deal-breaking degree. The movie is provided with an English DTS-HD MA 2.0 mono mix. Foreign language tracks include Spanish Dolby Digital mono and French, Italian, German and Castilian DTS mono with various subtitle options. Though it only features one channel of audio, this is actually a lively mix with pleasing range and fidelity. Dialogue is clean and thankfully free of the trademark thinness that plagues a lot of older mono tracks. I also didn't detect any major instances of hissing, crackles or pops. The film's rousing score reveals a wide, distortion free gamut of frequencies and both quiet and loud effects come through well. Galloping horses and firing bullets burst from the mix with pleasing fidelity and thankfully even when there is a lot of aural activity at once, the single channel of audio still offers nice distinction. Bass activity is fairly subdued, but there is some slight low-end rumble in some of the music cues and more aggressive action oriented moments. Balance within the track is good and speech is prioritized nicely. While the mix can't compete with modern surround sound efforts, the mono track is surprisingly robust and very effective. Free of many of the age related drawbacks that come with similar older mixes, the movie sounds very nice. Fun in the Country (SD, 5 min) – Presented in Dolby Digital stereo sound with no subtitle options, this is an amusing vintage promotional piece for the movie that is narrated by actress Jean Simmons. We are treated to various behind-the-scenes shenanigans between the cast and crew, including a card game between Simmons and director William Wyler, a chess game between Gregory Peck and Burl Ives, and Charlton Heston hunting a turtle... which he then races. So, in other words, despite having no real insights into the film's production, this is the greatest extra ever. TV Spot (SD, 1 min) – A TV spot for the movie is presented in standard definition with Dolby Digital 2.0 sound. Theatrical Trailer (HD, 3 min) - The film's original theatrical trailer is presented in 1080p with Dolby Digital 2.0 sound. 'The Big Country' is an exciting and thematically rich western that manages to play with and against the conventions of its genre. Video quality is mostly strong but some persistent flicker does hamper the overall presentation. The mono audio track is surprisingly robust and does a solid job of delivering the film's dialogue, effects and stirring score. Supplements are disappointingly sparse, but the included vintage featurette is quite amusing. Despite some minor technical flaws and a lack of extras, the strength of the film alone makes this an easy recommendation.